Published after Pride and Prejudice, Mansfield Park presents a very different heroine from that of Austen’s previous success. Fanny Price is often measured against Elizabeth Bennet, consequently being looked upon as inferior. On the outset, Fanny is indeed everything Lizzy is not. First of all, she is physically fragile, easily succumbs to exhaustion and fainting spells, very unlike Lizzy who can take on extensive walks in the outdoors, happily treading through miles of muddy paths. No rosy cheeks from such exercise for Fanny. She may have grown into a fair lady at eighteen, but she does not have Lizzy’s athletic prowess, or her pair of fine eyes, the trademark of her exuberance. Further, Fanny Price is painfully shy, an introvert. Readers may find her insipid, lacking glamour, but they may be more impatient with her passive, yielding personality. Why does Jane Austen present to us such a heroine, especially after the very lively and charismatic Lizzy Bennet? Well, I, for one, am glad to see Austen has demonstrated her wisdom by depicting an anti-stereotyped heroine. With Fanny Price, Austen has shattered the image of the typical heroine: a captivating beauty, quick witted and forthright, even audacious at times, endowed with energy and charisma. Why is reticence, or introvert nature being frowned upon? When did we start thinking of long-suffering and perseverance as negative traits? Why is humility not getting its rightful esteem? And, why are the quiet, observant and thinking female not as attractive as those who are more expressive, or who possess only outward beauty? What Fanny lacks in physical vigor, she more than compensates with her inner strength. And it is in the nobility of character that Austen has chosen to depict her heroine. Underneath Fanny’s fragile appearance is a quiet and principled perseverance. Seeing the impropriety of staging a play which entails the remodelling of Sir Thomas’ very private library in his absence, Fanny stands firm in not participating, despite the pressures and insults from her older cousins, the persuasion from the Crawfords, the scornful criticisms from Mrs. Norris, and even the eventual yielding of Edmund himself. Indeed, when it comes to moral uprightness, Mary Crawford is no match. Thanks to the way she defends her brother Henry who has snatched Maria away from her husband, even Edmund can now see clearly. Henry Crawford is a carnal schemer, and Mary Crawford is equally manipulative and egotistic. Unfortunately, it takes a scandal and trepidations for others to learn what Fanny has seen clearly from the very beginning. In a way, Fanny Price is more lucid than Elizabeth Bennet in not succumbing to the lure of vanity with Henry Crawford’s superfluous praise and wooing. If only Elizabeth had conquered that soft spot regarding Wickham earlier on….but of course, there wouldn’t be any story then. And if it is admirably bold for Lizzy to resist Lady Catherine de Bourgh, someone who is of no relation to her, Fanny is all the more courageous in her refusing to marry Henry Crawford by standing up against the very guardian to whom she owed her upbringing and her present living, the patriarch Sir Thomas Bertram. It takes extraordinary fortitude to go against everyone in Mansfield Park, and follow her own heart, while the privilege to explain herself is infeasible. Compared to other Austen heroines, Fanny Price is equally, if not more, worthy. Fanny has the passion of Marianne, while possessing the rationale of Elinor. That is why her secret love for Edmund can endure unfavorable conditions. Her lucid sense of judgement restrains her to reveal it to Edmund, who, with his emotional frailty, would be exasperated knowing his own beloved cousin is a rival rather than a friend of Mary Crawford. Her perseverance can easily match and surpass that of Anne Elliot. She may be uneducated and naive like Catherine Morland to start with, though equally moldable and respectful when taught, as the story progresses she far surpasses her mentor in insight and maturity . By presenting a heroine who may not be a typical favorite, Austen seems to be writing contrary to conventional norms. (But is it just modern audience who have differed in their expectations, resulting in recent film adaptations altering the very spirit and essence of Austen’s characters to appeal to them?) Has Austen created a character so different from her other heroines? 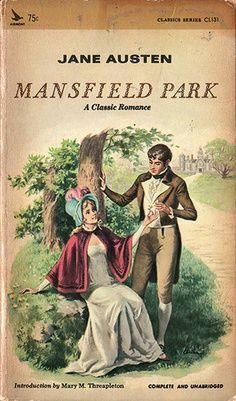 Comparing Mansfield Park with all her other novels, I do not feel she is particularly off her usual standpoint. As with her other heroines, Austen is more concerned with character, virtues, and morals, the inner qualities of the person rather than the outer appearance. Mansfield Park is the best manifestation of her stance.